The conference comes soon, and we would like to know whether you have any dietary restrictions. If so, we invite you to fill in this quick survey that will make your meals more enjoyable. For those of you who are interested, we suggest an informal gathering on Sunday around 5:30 pm on the Terrasse Dufferin, right next to the Château Frontenac (the one in the picture on the web site -- can't miss it). We can then break into smaller groups to go for drinks and/or dinner. The inscriptions are still open. The Eighteenth International Conference on Principles and Practice of Constraint Programming is the annual conference on all aspects of computing with constraints, including: theory, algorithms, environments, languages, models and systems, applications such as decision making, resource allocation, and agreement technologies. The 18th edition will take place in Québec City, Canada from October 8th to October 12th 2012. 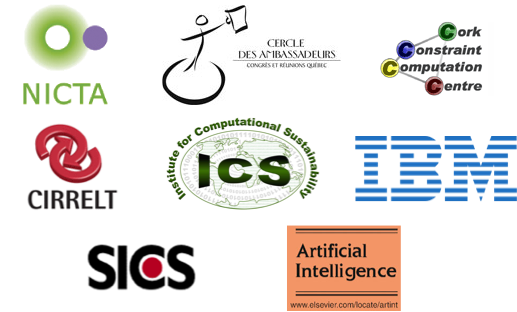 Find here a list of past CP conferences , or visit the Association for Constraint Programming.